First you need a scratch pad. You can measure if you wish but I like to just wing it. I do measure how wide the the scratchpad is but after that I just fold things over edges, mark them with my fingernail and score as I go. My Island Indigo card stock measures 7-7/16" x 3-1/16". It's not that important because each scratchpad is going to be different. Scratchpads are not precision work so it will be rare to find a whole pack that is exactly the same, especially if you buy them in bulk. I had gotten mine in bulk from Staples. Paper is heavy so you may have to pay a lot for shipping. Fortunately when I ordered these I needed printer ink so I was able to get my order high enough to qualify for free shipping!!! I took a full sheet of cards stock and cut it on the short side at 4-1/4". I did that so I could use the other side for a future card. I took the other piece and cut it the width of my scratchpad. Then I marked the edge of the card stock where the back of the scratchpad lined up to it. I scored that line. Then I marked the next edge where the card stock folds over the bound end of the scratch pad. I scored there too. Then I measured 2" from that last score and cut the end off. You don't have to measure. You can eye it, just make sure you have enough to fold over. The top edge is tucked under so a fold is showing on the front and not a raw edge. Plus that makes a little side "pocket" for you to slide in the strip of card stock to bind the top piece to the scratchpad. I took the strip of card stock that was left over from cutting the width of my scratchpad. I slipped it in the "pocket" and folded it around the scratchpad to the front. I cut off the end, leaving over an inch of card stock to slip into the other "pocket." Now for the assembly. Glue your card stock to the back of the scratchpad. You can tape it but you need the Sticky Strip. It just seemed like a lot of Sticky Strip to use and it's not as easy to work with if you get the pad on crooked. And trust me, it doesn't always want to go on straight. Glue the card stock to the bonded edge of the scratchpad, plus glue the inside flap to the white paper on the pad. The bottom photo shows the card stock glued to the back of the scratchpad. You can see the bound edge is not glued or that inside flap. In the photo the inside flap is facing outward. Once I glue that it will fold in and stick to the white scratch paper. Do not glue that flap shut or you will not be able to slip that strip of card stock inside. A note here: Even if you cut your card stock straight and think you glued it on straight, it may not end up straight due to the scratchpad being cut just a little bit crooked. Don't panic, it will still look fine. This part is a bit tricky. Put a little glue on one end of the strip and slip it inside the "pocket." I glued both sides of the card stock strip with a light layer of glue so it wouldn't ooze out or scrape off. Then I repeated that for the other side. Now your scratch pad is ready to decorate as you wish! I have a "notes" stamp that I had custom made a LONG time ago. I use it when I make notepads and notebooks. Next I stamped the pages with the fish from the "By the Sea" set. That took a little while to do. Just a note here. The image is not as sharp as it is when you stamp on card stock. Scratchpads are not the greatest quality of paper. But the image is clear enough and the paper is just going to be written on and tossed out eventually. And there you have it, a fun notepad from a plain scratchpad. These are very fun to make and after you make a couple they go pretty fast. It just takes a little bit of time to get the other end of that strip in. Just start with a corner of the strip and slowly work it in. You can bend the strip a little on the end, it won't matter, it won't show. It will be tucked and glued to the inside! Today I thought I would make a card using something that was just sitting around in my workroom. I have no idea why I had this image stamped and just sitting on my worktable. So today I thought I would just make a quick and simple card with it. Oh and the best part about putting a card like this together is, there was no stamps to clean up when I was done!!! I used the wood look embossing folder since I didn't have any other masculine looking background. I'm sure the dotted one would have looked okay too but I thought I would go with this. I used Early Espresso card stock since the ink looked like it was Early Espresso. I punched out the scalloped oval and set it in place using Dimensionals. The words were done on my computer, and I'm sorry, I do not know what font I used. I just find ones I like that will work well in the 1-1/4" circle area. A find like this makes putting a card together super simple and ever SO quick! I just can't seem to get enough of that "Work of Art" set. I love this particular image too! It's so fun and there's lots of things you can do with it. I try not to use it too often because I want to have some variety on my site!! But there are times when the ideas flow and you just have to run with them. I have not used this set too much lately so I figured I was safe!! I used Island Indigo for my blue color and Pistachio Pudding for the green. Aren't they fun colors together? The image from the "World of Dreams" set was stamped using black Memento ink. The words were done on the computer and punched out using the 1-1/4" circle punch, then the pistachio piece was punched out using the 1-3/8" circle punch and the indigo piece was punched out using the scalloped circle punch. Once those layers were put together they were set in place using Dimensionals. I just thought it was a super fun, quick, and easy card to make! Today I had not only ran across a piece of map decorative paper but I also ran across a stamp from Inkadinkado. I just loved the wording. And this train went SO well with the wording now, didn't it? I used Early Espresso ink. It's such a dark ink that it looked black. The base of my card is Crumb Cake, then a layer of Chocolate Chip, and then the map paper. It was great to be able to use that paper. It was starting to get wrinkled from sitting around. This was a fun card to make and a great masculine card. I thought it would be fun to use the train image and these words on a notebook. I think I may whip one up sometime next week! Today I am going to share with you a card I had received in a "Negative Space Technique" swap. This card was made by Nancy in Terri's downline technique night group. It's a little difficult to see but the star is punched out and then the star is punched out using a circle punch. Then a piece of gold glitter paper was affixed to the circle. The layers were set in place using Dimensionals. This looks like a quick and simple card to make. The base of the card is Basic Black with a piece of gold striped vellum set on the top and a piece of Washi tape across the front edge of the vellum. It's a very striking card and this photo does not do it justice. You can read more about this technique here. It's another card made using the technique but a bit more descriptive. I wasn't happy with the thank you card I made yesterday so I thought I would try a new one. I do like this one much better. I found this fun layout by Shauna at a Card a Day. I thought I would change the colors up for more of a fall look and go from there. I also liked the torn edge paper too. I use a little trick to get my layers to look good torn. I make the back layer longer, I usually don't cut the back layer until I'm done with the tearing part. I even up the bottom edges on both layers and then I rip my card stock. Then I slide the top layer up a little so it shows the layer and I mark the top of the back layer to where I need to trim it up to look like an even layer on all edges. Now for this one, my back layer strip wasn't very long to begin with so what I ended up doing was trimming the top layer just a little to make it all look even. You do whatever it takes to make it look good!!! I used the "thank you" from the "An Open Heart" set. The base of my card is Whisper White. The decorative paper is the new Tangelo Twist color and the torn card stock panel is Pumpkin Pie. I stamped the "Flower Shop" flower using Tangelo Twist. I also stamped it again using the black Memento ink pad. I punched out the center using the 3/4" circle punch. I set the center and the flower on Dimensionals. I tied the ribbon in a knot and then I cut it off the spool. I taped the raw ends on the back of the panel and then taped the panel in place. This was a super fun and easy card to make! I saw this fun layout by Sandi on Pinterest. There was no link attached to the card and the photo didn't have a link with it. I thought it was such a pretty card. I didn't want to add the wording because I wasn't sure what I wanted to use the card for. In leaving it blank I can use it for quite a number of occasions. I also changed the colors. I wanted to make more of a fall looking card. The flowery part is from the "World of Dreams" set and the butterfly is from the "Pappillon Potpourri" set. I stamped the whole flower image using Wild Wasabi. I took my blender pen and removed the ink from the flower part. Then I took the Mossy Meadow ink and touched the ink pad lightly to the greens. Next I took the Tangelo Twist marker and colored in the flowers. The butterfly was stamped using the black Memento ink pad and colored in with the Tangelo Twist and Crumb Cake markers. I set the butterfly in place using Dimensionals. The side panel was embossed using the Beautifully Baroque folder. I cut the piece in half on the short side and glued it in place. I don't have a lot of luck with the tape holding and I think it's a waste to use the Sticky Strip to hold it down. I added a ribbon down the middle to hide the seam. I layered the piece on a piece of Tangelo Twist card stock and that was set in place on top of a piece of white card stock as the base. And that was it. Pretty and fun too!!! Today I thought I would play with the "Too Kind" stamp set and use some fallish colors. I used Tangelo Twist, Pumpkin Pie, Wild Wasabi, and black Memento. I used some lace ribbon at the bottom and tied it with a piece of linen. The base of the card is Crumb Cake card stock. This is a very simple, quick, and fun card to make. I didn't have to travel too far down Julie's blog to find another fun "Lovely as a Tree" card. What a great masculine card this is! And again, it was a very quick and easy card to make. I love those quick and easy ones. They seem to be the "go to" cards. You need a card in a hurry and you know just which ones you want to remake! The base of this card is Crumb Cake. I also used Wild Wasabi card stock and ink behind the tree. The tree was stamped first using black Memento ink. I like that ink VERY much. It has the crispness of StazOn but it washes off easier. It's great for using the Blendabilities with. For the background behind the tree, I stamped the image once and then just moved it down 3 more times, stamping as I went (without reinking). Today's card was made by Julie K. from Terri's downline. This was one of the cards I had received in last month's swap. I LOVE it when I can participate in the swaps. I don't always have the time to do that! But when I do I always get such beautiful cards!! This technique is very fun to do too and it's not hard at all. You need a 4" x 4" piece of designer paper. Fold it in half and then fold it in half again. Unfold it and fold each corner to the center of the paper where the fold lines meet (dead center). Fold back the tips just to the outside of the outer folded edge. You really need to make sure your paper is a perfect square or it will be off kilter. And a bone folder will help make those creased on the second and third fold a lot sharper. See, I told you it was easy to make. Then all you do is add whatever you'd like on the inside of the shadow box and layer it on some card stock and you are done!! Okay, I have to say a big YUCK on this one. It went in a totally different direction than I had in my head. They all can't be winners now, can they??? For this interesting card I stamped the large flower from the "Beautiful Bunch" set using Hello Honey ink. I used a blender pen and removed the ink from the center. I colored in some of the new Tangelo Twist. Then I colored in the center are using Blackberry Bliss. The center of the flower was stamped using Blackberry Bliss and then I colored over it with the Hello Honey marker. I set it in place using a Dimensional. Thank you SO much for taking a look at this mess today! I found this fun card made by Becky at "Scrappin' and Stampin". I thought it would be a pretty easy card to make. I liked the layout and the simplicity of the card. 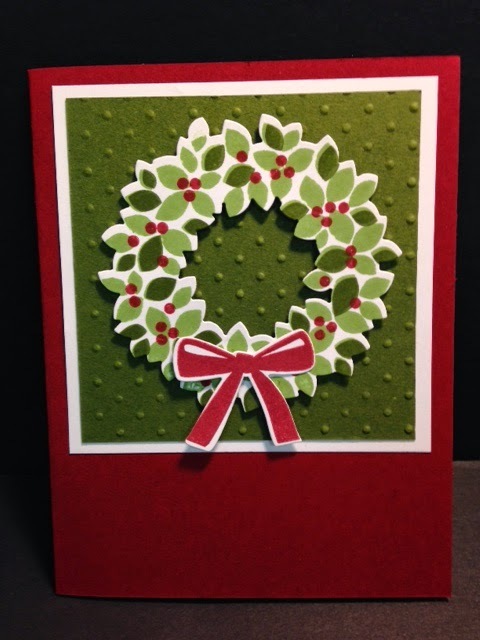 The original card used So Saffron on Very Vanilla card stock, I used Cherry Cobbler on Whisper White card stock. Becky's post is dated Friday August 31, 2012. The link doesn't take you directly to the card so I thought I would include the date she posted it so you can narrow it down easier. I really liked making this card and I wasn't sure where I should go with it as far as the sentiment was concerned so I just stared at it for a while and came to the conclusion that it would make a nice sympathy card. I found this card on the net while surfing for something else. I got distracted by this card and just had to make it. I forgot to save the link and now I can't find it. So, if you know who made this card, please let me know so I can give them the credit they deserve and a link back to their blog. The original card was done using red ink and black decorative paper. I used the" Bloom with Hope" stamp set. And the words are from the "Teeny Tiny Wishes" set. I used Rich Razzleberry card stock. And I had used the new Blackberry Bliss for the decorative paper. The colors go nicely together but that wasn't the look I was going for. I colored the flowers using the Blendabilities markers. It went really quick. I like the markers but I do find that a blender pen gets the same results. As you color from the center up the ink on the blender pen gets lighter. Same effect!!! Anyway, I used the markers and I did like how it turned out. This was a very easy card to make. There's lots of fun elements in it. Rhinestones and pearls, OH MY!! Scalloped punch. Oh and that layer was set in place using Dimensionals. The words were also set in place using Dimensionals. Such a sweet and easy card to make. Today I finished up a project I had started last week. I worked on it a little at a time because I was too busy with other things that I couldn't devote all of my time to working on it. It's a very simple project to do too. First I went to the Dollar Tree and picked up a hard covered book. They had their Halloween stuff out and I found a package mixture of "things". Spiders, bats, skulls, and skeletons. I did have to use my heat tool on them to get them to lay a little flatter, mostly the spiders. But don't get them too hot and flatten them, they will lose a lot of their detail. Fortunately there's a lot of pieces in that bag for a dollar that I was able to practice on a few to get the right touch. For the spiders, once you see the legs start to shorten, stop and put something heavy on top of it. The book you're going to use will do nicely!!! Next I did my lettering. I cut out lots of letters to spell out the word "spells." I glued 3 letters together to make them a little thicker so they would stand out nicely on the book. Once I had everything glued in place on the front I did the spine. I took some black card stock and cut strips and glued 3 of them together too. I wanted to make those fun lines on the top and bottom of the spine to make it look like it was a really old book. I trimmed them to the thickness of the spine. When gluing those strips and the letters in place, you want to bend them a little bit so they lay over the spine. The spine is not completely flat. Then I laid the book face up and began the fun. I put a piece of tissue paper over the book and made a mixture of white school glue (any white glue will work), black paint and some water and I covered the front with it. The tissue paper would get air pockets but when I tried to push them out with the paint brush the tissue would tear a little, which was okay, it made the book look even older. Plus I knew I was going to be adding one more layer of tissue paper to it anyway. After the 2nd layer looked fairly dry I squeezed a sizable amount of black paint on the front and covered it. I repeated this for the spine and the back. The back was easy because it was flat but I did make sure that the tissue paper didn't lay perfectly flat on it. I wanted some wrinkles and tears. After the paint dried I took my book out in the garage and sprayed a layer of clear acrylic spray over the front and added some black ultra fine glitter to it. I found my glitter at Michael's, it's by Martha Stewart. I let the spray dry and my book is now ready for Halloween!!! Those little letters were perfect for this project!! !